Estella's Revenge: #AMonthofFaves: A Year in Books Timeline! #AMonthofFaves: A Year in Books Timeline! 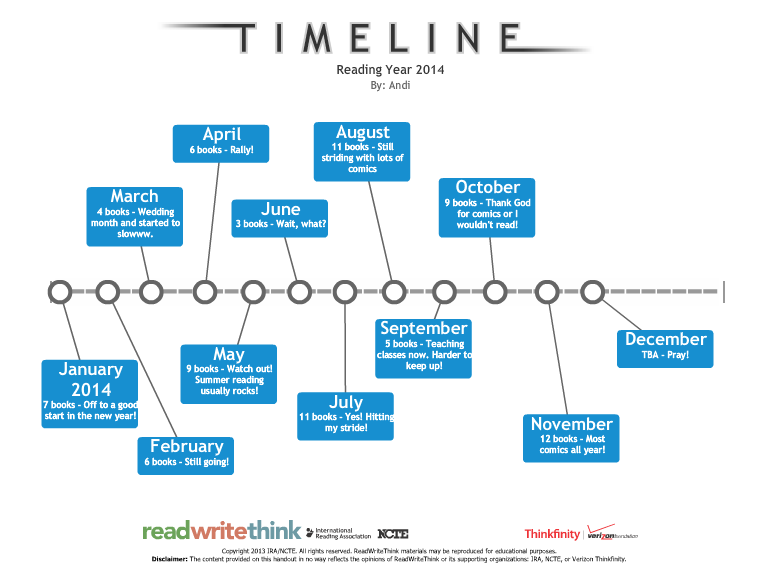 Today is all about a reading timeline. You can mark the big events however you'd like, but I'm going to be taking a look back month-by-month to see what was shaking. Link up at Girlxoxo.com today! January - 7 books - Off to a good start in the new year! February - 6 - Still going! March - 4 - Wedding month started to slowww. April - 6 - Rally! May - 9 - Watch out! Summer reading usually rocks! June - 3 - Wait, what? July - 11 - Yes! Hitting my stride! August - 11- Still striding with lots of comics and novels mixed up in August! September - 5 - Teaching classes now. Getting a little harder to keep up. October - 9 - Thank God for comics or I wouldn't be reading at all. November - 12 - Same thing. The most comics read all year in November! December - How will the year end? This month is off to a slow start. I think in all you had a great year, with ups and downs like all of us, but good in general. I love the graphic timeline, I should've done mine like that, but oh well. See, I knew there was a way to create a real timeline! I read that post on Read Write Think ages ago. So now I'm going to add one to my blog, so yeah. Thanks for that. Ha, I love your timeline (Read, Write ,Think is the bessstt)! I think it's pretty normal to have ups and downs like that, especially in a year with a wedding and a ton of new experiences. Shake it off, girl. I think overall you had a good year. We all have our ups and downs, because life is completely unexpected. You can safely call it a successful year. Wow that is great! I wish I had more than I did this month. Congrats on the wedding and your new marriage. Ooo, I like how yours is actually like a graphical timeline. Mine's just your average text based ramble. ;-) My month is definitely off to a slow reading start, too. Hopefully, it'll rally at the end! I totally stole your timline idea, I hope that's okay. Apparently my slowest months are in the summer. My verbal timeline got a little extensive, since I read so much for the year. :) I look forward to what others posted on their timeline, such a fun post!! With such a busy year it's a wonder you've read at all. December is always slow for me. It's been a busy year for you! I think we all have those occasional 3 book months. Sometimes it's a win just to read anything! 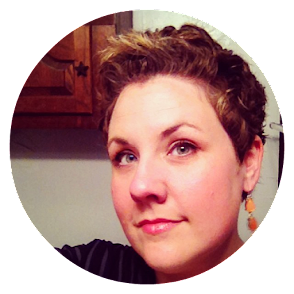 I love the way you formatted this post, too cool! Such a fun timeline. We all read at our own pace...embrace your unique passions!! I like your timeline! Much more original than mine. In general, I read rather the same number of books from one month to another but this year has been full of ups and downs like yours and I not always have explanations. I supposed it's called life. Lol, these made me laugh. Good old NCTE - was that a blank graph on read write grow.org? Pretty cool. Who cares if it's comics you're reading - you're reading! Plus you're reading some stuff you're really enjoying so it's all good.